Eureka Entertainment recently released the 1943 biopic The Song Of Bernadette, on Blu-Ray for the first time in the UK. The film was based on the 1941 historical novel of the same name, by Franz Werfel. 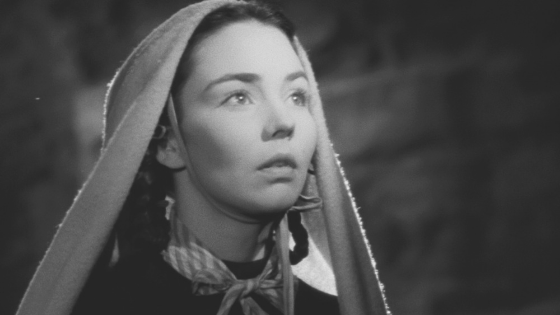 Jennifer Jones, in her first lead, played the title role, for which she won an academy award. The film also features performances from Vincent Price, Lee J. Cobb, Charles Bickford and Gladys Cooper. The release forms part of the Eureka Classics series, but is it worth checking out? Bernadette Soubirous is a peasant girl living in a poor village. Her family have little, her father is out of work and she is sickly. One day she goes with her sister and friend to gather firewood, and suddenly she sees a Heavenly lady. Widespread ridicule, intrigue and then devotion spread through the villagers and eventually Lourdes begins to attract visitors from all over the world to partake in the miraculous cure. The Song of Bernadette is definitely approaching epic status. It takes two hours and 36 minutes to tell Bernadette’s story, taking us along with her from the unstudious and slightly vague schoolgirl through years of being questioned, bullied, doubted and eventually idolised. It is quite an emotional journey, and rather unexpectedly so as the storytelling style was, for me, rather distant at the beginning of the film. I didn’t expect to become attached to the characters or really feel much sympathy. Somewhere around an hour in, I noticed that I was feeling quite invested emotionally. Many of the actors were, I admit, unfamiliar to me, which frankly I found made it easier to concentrate on the story. This is not a film which seems to rely heavily on types, instead of allowing subtle yet clear characters to develop and see the narrative through. Although it dragged a little at times, there was much to say and time needed to be spent moralising and making certain points. Allowing all characters to view the events in their own way, and to act accordingly, gave us as the viewer the chance to form our own opinion regarding the issues being explored. So in conclusion, I think it well worth seeing this film. It is clear to see why Jennifer Jones was awarded for her portrayal of Bernadette, but the supporting cast does a stellar job of portraying the characters; Price’s performance as the sceptical Prosecutor Vital Dutour is a highlight. If you’re looking for something thought-provoking, this may well be it! The Song Of Bernadette can be ordered from Amazon. ← Classic Wyatt Earp series comes to Amazon Prime.